CATHOLIC GIFT SHOP LTD - Lourdes Apparition Wall Plaque & Holy Water Gift Set. 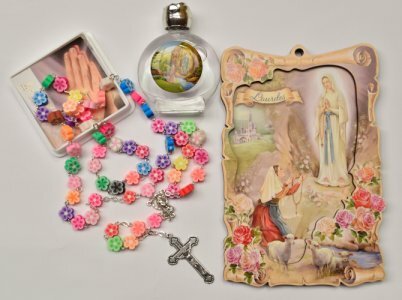 Lourdes Apparition Wall Plaque & Holy Water Gift Set. > children's multi coloured soft resin petal shaped rosary beads the centrepiece depicts the Virgin Mary. This rosary comes with a small card on how to say the rosary. > 2D wall plaque depicting the Lourdes apparitions.